Being greeted by the sight and smell of this brings much happiness! Goodbye week of $9 burgers and $15 pasta. 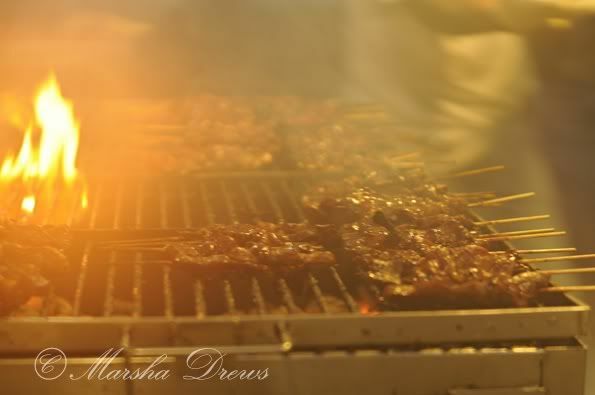 Hellooo $1 BBQ pork on a stick!!! It was seriously the BEST food I have had in forever and worth waiting in the rain to catch the Chamorro Village Wednesday Night Market shuttle. With the rainy weather and crazy large crowd, I didn't get many pictures and didn't hang around for any music or dancing or whatever else they do there. 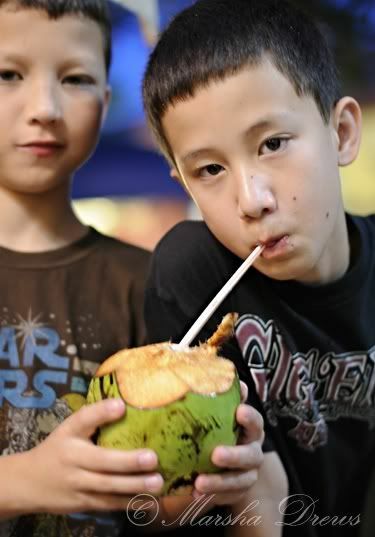 We ate our pork, washed it down with some fresh coconut (milk? water? juice? ), and shopped a few vendor tables. While I have had more Korean food here than I ever get to eat in Houston, I miss cooking at home. If you spent two months on an island, what food would YOU miss the most? and I would miss Starbucks, but since it's an American Territory, maybe they have one? Don't eat pork or coffee...so you post is not getting me as excited as it did you! :) BUT I love your cotton candy shot and I am sure it was a nice change of pace! I think I would just spend lots of time at the barbecue stand (types Dawn, who finally learned that barbecue doesn't have a "q" in it). I want to know what aseptic milk is too. :P That bbq on a stick looks delicious! I'm glad you found something cheap and yummy. Hmmm....not sure what I'd miss if I were on an island for 2 months. Since you do a lot of cooking, I'm sure you miss it. I love you!!! Oooh....that BBQ looks goooood! And the cotton candy, too! Not so much that weird cake since it involves tapioca-like substances (ick!). Glad you found something cheap and good! I think I would miss the things that even if I didn't eat it often back home, just not being able to get it would make me miss it. Like...beef stew. Or spaghetti. It sounds like SO much fun. I just love your adventure. And your precious boys. 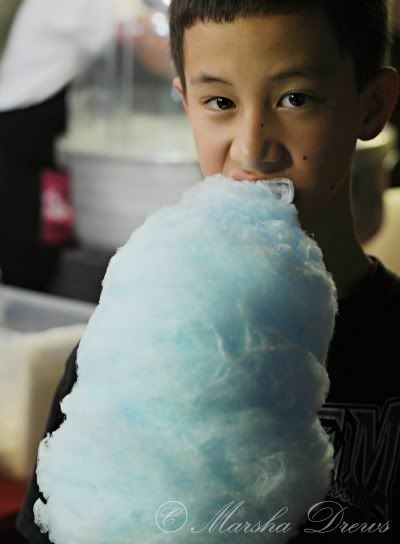 : ) Cotton candy to end the night? That sounds perfect to me. Oh that does look yummy! And what a good price. I'm sure you'll be back. Hmmm... I would miss tri tip and London broil with garlic and mashed potatoes. 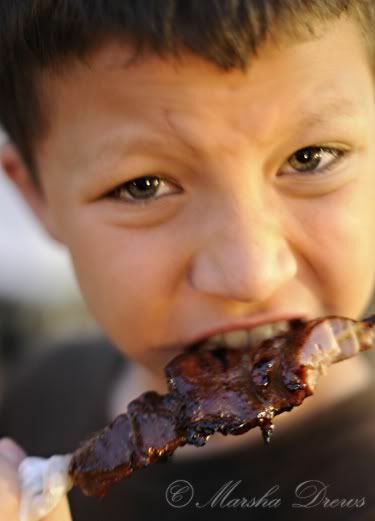 Okay, so that bbq reminds me of my childhood and I so miss my grandpa right now! Yummy memories. 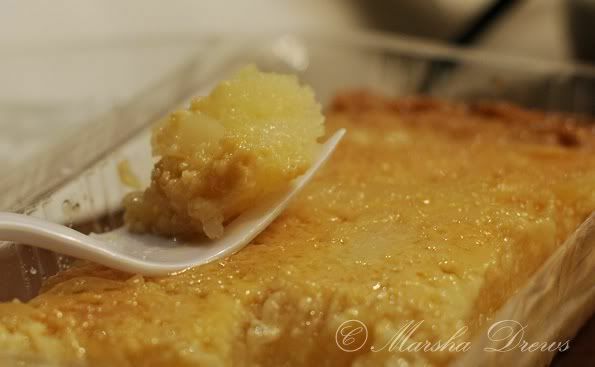 But, to entice you further and motivate you to come see me... Nana makes the BEST cassava cake E.VER. Truly that pudding sounds good! My favorite is coconut jasmine rice pudding (Thai), which I usually eat for breakfast (and snack :)too. Okay, I'm getting on the next plane to join you! Mmmm...I can almost smell that meat sizzling on the grill. That's funny. I'm not stuck on an island, but I'm stuck in a small town in TN. Does that count? There are quite a few things I already miss while being here. I guess my travel time (seven hours) to whatever I really miss isn't as long as yours. I would need a cupcake (probably chocolate) every few weeks. One day, we need to go out to eat together because I like to eat too. You can eat the pork, etc. and I'll eat the vegetables. Nah. Cotton candy for everyone!